Intelligence inside for automated fiber laser cutting. Our mid-tier CNC fiber laser cutters are not ‘bigger is better’ or ‘goedkoop is duurkoop’, but rather feature a brilliant mix of high end components, thoughtful, practical design and quality craftsmanship to deliver superb value for money. In addition, as an optional upgrade we give you access to the world of CNC pipe cutting, for square and round pipes up to 6000mm. By using trickle down technology and lessons learned from our high power (4 KW+) range, including power sources from IPG and laser cutting heads from Raytools as well as fast, accurate motors, gearboxes and positioning systems from Atlanta, Yaskawa and PMI, we can bring you a range of CNC fiber laser cutters that punch far above their weight, at a cost that will be a pleasant surprise. What's more, choose to add the optional fiber laser pipe cutting feature and you have a powerful production ready tool to take your business to the next level. Enjoy peace of mind with a reliable, high production capable CNC fiber laser backed by great after sales service. IntelliCut CNC fiber lasers deliver on the MTO promise of ‘Right Quality, Right Price’. The Right Technology: IntelliCut CNC fiber lasers have years of R&D experience in small and medium-power laser cutting machines invested in them, combined with advanced design, precision production and quality components. The Right Efficiency: Easy to use control for job set up, capacitive head for plate detection and height control, compact footprint and easy loading, single-axis movement speed of up to 100m/min, re-position accuracy of 0.03, position accuracy of 0.05, and single-axis acceleration of up to 1G delivers accurate, high speed, industrial level production. The Right Accuracy: A double drive, aircraft grade aluminium cast gantry, coupled with a solid cast cellular machine frame that has been annealed and aged after welding ensures excellent rigidity. Matched to this is a set of PMI linear guides, Atlanta reducers/racks/pinions and Yaskawa servo system for very high precision. 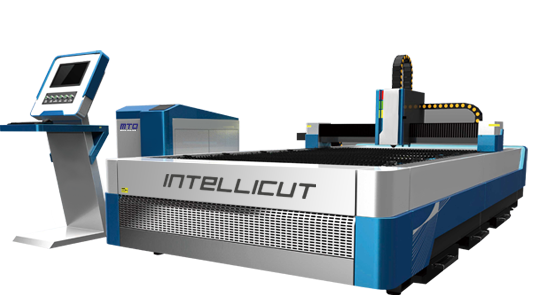 The Right Stability: IntelliCut CNC fiber lasers embody practical and simple design to take full advantage of maintenance free fibre laser transmission in laser cutting.The technology is mature and the Cypcut control software is proven for years of trouble free production. The Right Price: IntelliCut CNC fiber lasers stay true to the MTO promise of exceptional value for your money rather than being the cheapest on the market. Relative to our competitors, our lasers offer a unique mix of both value for money when compared to high end brands, and exceptional quality and performance when compared to cheaper brands. Cutting range: 3000mm x 1500mm. Capacities: 500w, 700w, 1000w, 2000w. Control: CypCut control with friendly user interface, full system parameters control (cutting speed, torch height, air pressure etc. ), graphical processing of drawings, drawing library, automatic nesting, cut simulations, DXF, AI as well as G code file format importing, USB interface and much more. Machine frame: Solid cast table with cellular internal structure, annealed and aged for stress relief to avoid deformation after welding. Adjustable for levelling and height. Includes drawer trolley for cut parts access. Gantry: Double drive aircraft grade cast aluminium gantry featuring whole body machining for rigidity and accuracy. Cabin: IntelliCut laser can be optioned with full cabin for safety and laser radiation blocking. Exchange: Only available in conjunction with optional cabin, to load and unload plates automatically. Drive system: Japanese Yaskawa drives and motors. Guide system: Taiwanese PMI linear guides. Optical path: Optical fibre with no reflective lenses required for maintenance free operation. Cutting head: Swiss Raytools BT 240 cutting head with capacitive sensor for plate detection, height control and real time laser output power adjustment to avoid over burn on corners. Anti-reflection optics for aluminium and brass cutting. Laser source: American IPG laser source featuring water cooling, very low maintenance, gas free operation and requires no adjustments. Electrical: German Weldmuller components, Japanese Omron limit switches. Cooling system: Highly efficient water cooling system with required filters. Optional auxilliary gas system: Nitrogen and clean, dry compressed air can be used. Requires compressor, refrigerator dryer unit and coalescing filter. Exhaust system: Suction system for expelling dust and gas from the table. Lubrication: Central lubrication system distributes oil to the required components.